Thailand enjoys the best location to become the region’s transport hub and trading centre, as it shares 5,656km of borders with four countries (Myanmar, Laos, Cambodia and Malaysia). In addition, the Asian highway network and three main economic corridors pass through the country. 1. East-West Economic Corridor: links Myanmar, Thailand, Laos and Vietnam with approximately 1,500km of roads. Mae Sot in Tak province has become the new main city of the corridor, as it is only 447km from the Yangon, the business hub and main port of Myanmar and only 163km from the port in Mawlamyine. Myawaddy, just across the border from Mae Sot, has been transformed into a new industrial centre after the Myanmar government declared it a special economic zone. A lot of foreign investors have built factories in the zone, some of which had been moved from Thailand. Most of these are labour-intensive industries, as the minimum daily wage in Myanmar is still dramatically lower than in Thailand. Also benefiting Mae Sot is the fact that Myanmar is developing rapidly and most of the construction materials it requires are imported from Thailand. Total export and import turnover in Mae Sot last year was 46.31 billion baht, an increase of 17.5% from 2012; this represents significant growth and will probably be higher in the future. 2. North-South Economic Corridor: links China, Myanmar, Laos and Thailand with 1,280km of roads. The main city in the corridor is Chiang Khong in Chiang Rai province. In the past, Chiang Khong was the main port for many boats from China and other countries along the Mekong River. But the official opening of the fourth friendship bridge (Chiang Khong-Huay Xai) last December has been the major factor affecting the city. Many foreign investors, mainly from China, as well as Thai investors, began focusing on Chiang Khong after the Thai government announced the development of the new bridge. This is because Chiang Khong is the starting point for Route R3, the main highway to China. The Lao government is also trying to attract more foreign investors by announcing many special or specific economic zones along the Thailand-Laos border. The Boten Beautiful Land Specific Economic Zone is close to Huay Xai and not far from Chiang Khong. In addition, the zone is adjacent to Route A3. Chiang Khong is on the way to becoming the new trade and logistics centre for Thailand and Asean. 3. 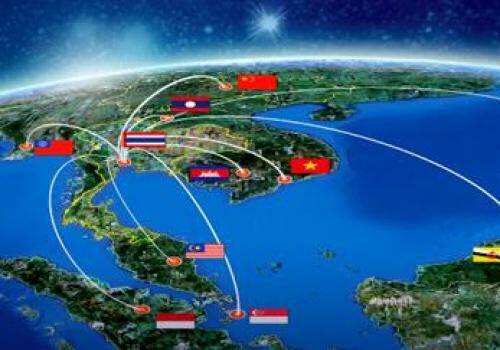 Southern Economic Corridor: links Thailand, Cambodia and Vietnam with 1,005km of roads. Aranyaprathet in Sa Kaeo province, the main city in this corridor, has been thriving for years because of its proximity to the many casinos in Poipet, Cambodia, that draw Thai and foreign tourists alike. The Rong Kluea Market in the border area is a famous shopping destination similar to the markets at Mae Sot in Tak and Mae Sai in Chiang Rai. In addition, the North-South corridor may extend ultimately to Dawei in Myanmar, if the motorway from Bang Yai in Nonthaburi to Kanchanaburi is finished in the future. Some deep-sea ports in Thailand are also close to this corridor, and ports in Cambodia and Vietnam are not far away. Total export and import turnover through Aranyaprathet last year was 51.63 billion baht, a rise of 14.8% from 2012, and values are likely to go higher in the future. As border trade grows in importance in these Thai centres, a lot of Thai and foreign investors are developing residential projects, shopping malls, speciality stores and superstore malls in the areas. Some developers are planning new projects covering all sectors in all of the main cities in the border provinces. Some local developers have also launched many condominiums in Chiang Rai to support the huge number of people who have moved to study and work in the province as well as foreigners who have opened import-export businesses in Chiang Khong. Mae Sot has also become a new destination for investors and developers; the first condominium projects in the city were launched last year and had high take-up rates. Land prices in Mae Sot have increased sharply in the past few years, and some plots along the main road to Myanmar have doubled in value. A lot of new shophouses, warehouses and logistics centre projects are under construction and scheduled to be completed in the future in both Mae Sot and Chiang Khong. Some developers have also introduced condominiums in Aranyaprathet this year to support Thai and foreign businessmen in the area. Despite the rosy outlook for some border provinces, political instability in Thailand remains the major concern affecting the confidence of both Thai and foreign investors and businessmen. All countries in Asean are trying to attract more foreign investors by introducing new incentives and developing better infrastructure to increase their competitiveness. Although Thailand is located in the centre of Asean, if its political deadlock is not resolved soon, there will be an impact on investment and tourism.